Exposed to CER RJ Admiral Rattler for Spring 2019 calf. Cinderella is purebred but not registered, so her calf will not be registered. 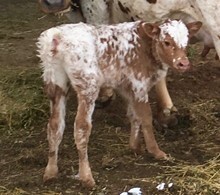 Every calf has been healthy and wildly colored with good horn. $1400. Cinderella's gorgeous frosty heifer calf is SOLD. CER Cinderella is a non registered, Longhorn cow due to the fact that she was range bred within a herd of Longhorns on a nearby ranch...no records...therefore no TLBAA registration papers. She has consistently produced colorful, really handsome calves with friendly natures: CER St. Nick 12/25/2016 and CER Haileys Comet 3/30/2017 and CER Moondust 2/20/2018 (see pictures on our webpage!). She has been an excellent mother and is due to present us with another excellent baby in 2019! Cinderella is offered for sale exposed to our TLBAA registered bull CER RJ Admiral Rattler. $1800.